If you have very specific needs and you know what you want, the “Hammer” the wheelchair for you. 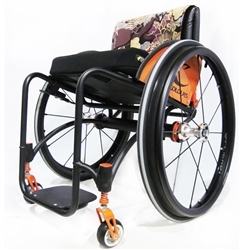 Get serious with wheelchair sports and hit your adrenaline to the max with Colours Wheelchairs. 25" High Performance Sport Wheels. Adjustable back height, center of gravity and front and rear seat heights. Works great for any court sport. Adjustable seat height, back height and angle adjustment allow chair to be configured for specific sports and disabilities. 6061-T6 Aluminum; lightweight and strong. Adjustable Back Angle on the Folding and the Fixed Backrest Options. An 8-degree angle adjustment is standard. The Invacare® Top End® T-5 7000 Series Tennis wheelchair is faster, lighter, stronger and better than its predecessor! This tennis chair also features the Nord-Lock bolt securing system for the axle receivers. One way to achieve the goal of becoming one with your wheelchair is through several vital measurements some manufacturers seem to ignore. The "Zephyr Sport" will improve your mobility through the court amplifying your game, taking it to the next level! Titanium Seat-Frame: Titanium is more than twice as strong as aluminum. 5th Wheel Anti-Tip: The Quickie Ti Match Point features a standard single integrated fifth-wheel anti-tip. The Quickie Ti All Court features a 5th wheel anti-tip brace. This adjustable brace, located between the backrest towel bar and the integrated anti-tip, eliminates the rearward flex in the seat frame caused when a player leans backwards. It is the pick of Boston Marathon champion Ernst van Dyk as well as top wheelchair athletes from around the world! Designed for speed, the Invacare® Top End® Eliminator™ OSR racing wheelchair offers exceptional stability and aerodynamics. When you are an aspiring athlete, durability and quick, easy adjustments in an affordable package are the way to go! Adjustable front and rear seat heights Anti-tip/5th wheel: Adjustable height Fixed back. Lightweight large diameter tubing adds strength to withstand impact. 16 and 20 degree camber options. 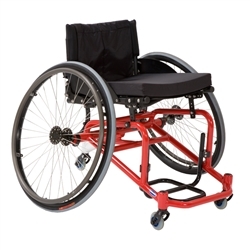 Court Wheelchairs are designed for those practice sports in their wheelchair. The sturdy wheel and low center of gravity make this chair ideal for any tennis or basketball court.